Downtown Eureka Springs is full of restaurants, shopping, and historic trails. Winter in a mountain town is exhilarating! The cool, crisp air and serene surroundings set the perfect tone for a Winter getaway. Relax in a Spa – Eureka Springs has world class spas and whether you prefer a simple Swedish massage or one using hot stones, Eureka Springs Spas have highly trained technicians familiar with both traditional and new massage techniques. Duet massages allow you to enjoy total relaxation with your partner. Salon services like facials, manicures and pedicures give you that polish you want for the holidays. A snowy retreat at the Treehouse Cottages. mountain streets and visit more then 60 natural springs. Most of the springs run full during this time of year and each one is unique. Small pocket parks near the springs are decorated for the season and plaques share the history of the springs. 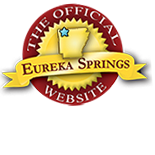 After all, people have been visiting Eureka Springs for the springs for hundreds of years. Get Creative – Bring your camera. Eureka Springs makes amateurs look professional with abundant photo opportunities. If you are feeling extra creative, consider taking a class at the Eureka Springs School of the Arts. Treat Yourself – Dine at one of your favorite (or soon will be your favorite) Eureka Springs restaurants. Enjoy amazing views in private seating instead of fighting the crowds and waiting in long lines. Try something new, take your time, enjoy the town and the company. Find Romance – Take a short scenic walk with your favorite person on one of the many trails in Eureka. Take a carriage ride or meet at the fountain in Crescent Park. There are many opportunities to kiss when no one is looking. Go ahead, make some memories. the Lake Leatherwood Dam Bridge. Explore the Woods – Eureka Springs is a mountain town with a rich history. Hiking around town reveals amazing architecture, art, and landscape. Read more about Eureka Springs outdoors and the Arkansas Art Trail. You will find that visiting Eureka Springs is enriching. Outdoor adventure is waiting for you. Catch up on your ZZZs – During the winter season, most hotels , B&B’s a, cabins and lodging facilities offer deeply discounted pricing. That one-of-a-kind cottage, suite, or room with a Jacuzzi is likely available for a great deal. Vacation packages and last minute deals are always listed on ReserveEureka.com. Disconnect – This is an option often overlooked. How often do you get away to just relax? No agendas, no schedules…just do what you want to do. Read a good book (if you didn’t bring one, a visit to Eureka Springs’ Carnegie Library can help you out. It is located in historic downtown Eureka Springs. This entry was posted on December 14, 2016 by service424 in Crescent Hotel, Family Fun, Fun Downtown, Things to Do and tagged carriage rides, dining, discount lodging, downtown, Eureka Springs, Eureka Springs School of the Arts, Fine dining, food, historic downtown, historic hotels, history, natural springs, Outdoor, photography, Winter.